While models of identity and student development have been essential tools for student affairs practitioners, intersectionality has increasingly been recognized as an analytic framework that captures the complex interaction of social identities at the personal level and in larger social systems. 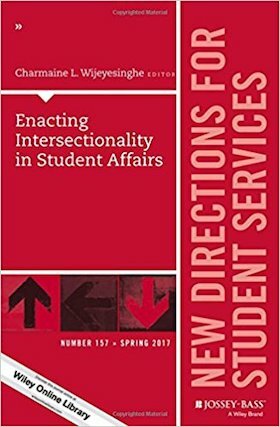 This volume demonstrates how intersectionality informs and enhances student affairs practice in the areas of student identity theory, programming, research, coalition building, residential life, service-learning, international student services, and strategic planning in significant and transformative ways. Describe how its core tenets enhance our understanding of resistance, privilege, and students’ responses to social justice education. groups or what additional social categories should be considered when addressing identity from an intersectional perspective. This is the 157th volume of this Jossey-Bass higher education quarterly series. An indispensable resource for vice presidents of student affairs, deans of students, student counselors, and other student services professionals, New Directions for Student Services offers guidelines and programs for aiding students in their total development: emotional, social, physical, and intellectual.